Four years ago Eric Lehnhardt came to Arizona State University, where he met the love of his life, discovered his passion and started a new social entrepreneurial venture with a team of students to feed the Valley’s hungry. His ASU journey started when he joined the Barrett honors community his freshman year, and quickly became fast friends with other students on his floor. One of those original students on his floor is now his fiancee, Loni Amundson. After meeting as friends during their freshman year, the two began dating about a year later and will be married in Flagstaff, Ariz., in August. “We were friends from the beginning,” he says. 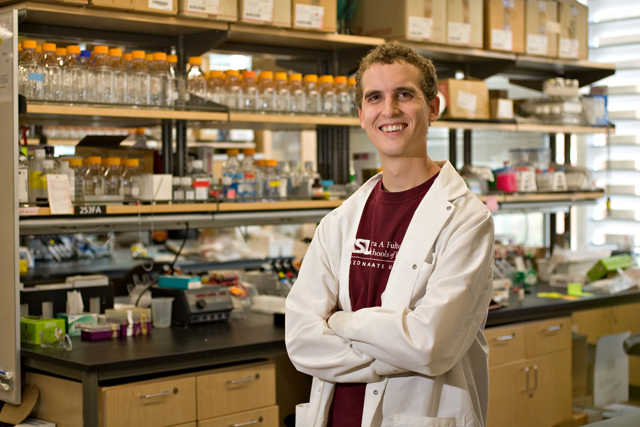 Lehnhardt also discovered biomedical engineering at ASU. Choosing this major offered the chance to use his engineering skills to improve health care while working in a challenging field. Another highlight was the Engineering Projects in Community Service (EPICS) program in ASU’s Ira A. Fulton Schools of Engineering that proved to be an inspirational endeavor, as it was instrumental in developing the FlashFood concept to feed the Valley’s hungry that earned top Microsoft Imagine Cup national honors. That spirit of social entrepreneurship earned Lehnhardt and his ASU team – Jake Irvin, Katelyn Keberle, Steven Hernandez and faculty advisor Richard Filley – a first place finish in the Microsoft Imagine Cup U.S. Finals in the Design Software category for their FlashFood project that focuses on providing food to areas in the Valley that are “food deserts,” or only served by fast food or convenience stores for a mile or more. Some people who live in these food deserts have to choose between dinner and paying for necessities, such as electricity. FlashFood uses a system of text messaging, a smartphone app and a website to take food left over from events, such as a convention or catered seminar, and then distribute it as quickly as possible to the hungry in the Phoenix metropolitan area. Those who have leftover food can use the app or visit the website and then put the information into the network to alert volunteer drivers to pick up food and transport it to a needy neighborhood, where those in need are informed through text messaging that food is available at a specific location. “We’re currently developing our pilot program,” he says. So far the project has earned $14,000 in prize money, and FlashFood has advanced to the Imagine Cup World Finals, set to take place this July in Sydney, Australia. Between his time working on FlashFood and studying for classes, Lehnhardt also has contributed to research in Michael Caplan’s lab, where he has focused on translational work, such as working with cells that line the arteries and veins, and examining how the cells change in micro-environments in order to explain disease states such as diabetes. Caplan is an associate professor in the School of Biological and Health Systems Engineering, in ASU’s Ira A. Fulton Schools of Engineering. “I have diabetes on both sides of my family,” Lehnhardt says. Lehnhardt also enjoyed a stint working with cells in Krystyn VanVliet’s lab at MIT for a summer internship, and he traveled abroad for a semester in Spain during his sophomore year. In Spain he traveled the country and enjoyed the culture that eschews stress. After graduation this May, the summer will bring a new challenge when he undertakes an internship for a company that makes materials used in medical devices. After that, he may continue his studies, or he may pursue FlashFood and help solve the Valley’s hunger problem.